You may remember that I previously featured Duke by James T. Edmondson a while back... well he's back with more awesomeness! Lavanderia is based on lettering found on laundromat windows in San Francisco's Mission District, it features numerous opentype features and three weights. And hello! it comes complete with punctuation, numerals, upper and lowercase... which is not always the case with certain "free" fonts. Lavanderia is available from the always amazing Lost Type Co-op so that means, you guessed it... FREE! Please be sure to visit my #FontFriday friends: Aerialist Press, Alison Owen Design, And Everything Nice, Blush Printables, Brancoprata, Bubblerock Studios, Design Editor, Fourth & Folded, Go Against The Grain, Hank & Hunt, Honey Bee Invites, Lauren Elise Crafted, Leukst, Little Bit Heart, My Paper Lounge, Palm Papers, and Weswen Design. Awesome! I just love it and you know I'm going to get it right now! Um LOVE IT! Downloading it today! Thanks Kerry! 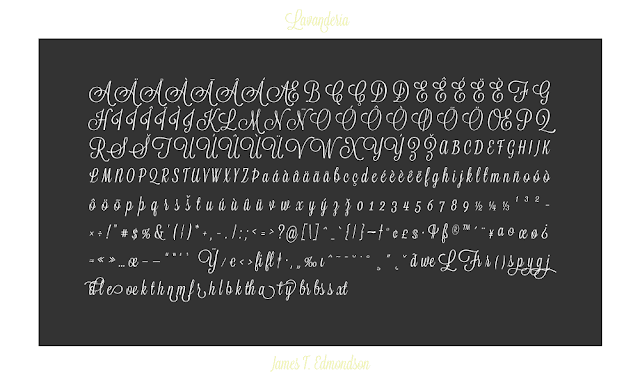 love a great free font! nice pick! Laundromat windows!? So cool. Great find Kerry! Love the font! Great find!! I downloaded it and does anyone else have the problem with the lower case a and e with the swash on it? How can I get it to be a normal cursive a or e? Is it because it's a free font? @ Anonymous- It's an Opentype font so you may need to look at your Opentype panel... assuming you are working in Illustrator? I had no problems with it. Is anyone else having problems using all three styles of this font in InDesign? I have verified that all three are installed on my system, but only the Delicate weight is available in InDesign. The other two don't even show up in the font list. Any ideas for another font to mix and match for a wedding invitation? Suggestions would be appreciated! Thank you. You can "name your price" so if you don;t want to pay for it then enter 0... however, I believe the license is restricted in that case.